This beautiful rendition of Germanic landscape artistry depicts a "Chance meeting of 5 people"...a wise old man, his wife and son cross the path of a wonderfilled couple under the shade and safety of evergreens and a blustery blue sky. 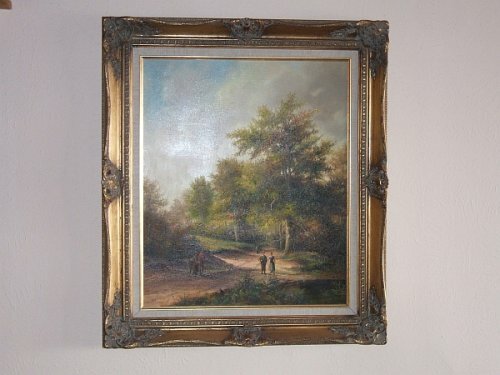 This is a collector's quality oil painting that will certainly increase in value over the course of time (his grandfather's paintings are Smithsonian quality and are of high value). Perhaps this work of art will be the beginning of your collection or posssibly round out your collection. Many of us can not afford to invest in million dollar paintings but you can own a Gegel for a mere fraction of the cost. This painting was originally purchased at auction by a wealthy telecommunications CEO and was given as a gift as a token of sincere thanks. It is time to share the beauty and magestry that eminates from this priceless and timeless artwork. Provenance of the artist: Gegel was born in 1940 in Castrop-Rauxel. He attended the Volkshochschule in Castrop-Rauxel since 1960, he then got in touch with Runge, a relative of the most famous German Romantic painter Phillip Otto Runge. To be in contact with art has been a law in Gagel families for generations. Grandfather was the painter Friedrich Gagel, and well known painters were father Hans and uncle Otto Gagel. Last, but not least Bernd was trained since 1963 by his father in law Karopka-Brantler.This is a clear piece of artistic history. Make it your own, today!